The Cambrian explosion was certainly a time of unprecedented evolutionary diversification that laid the groundwork for the body types and basic structural organizations that still dominate the world's biota today. The rapidity of this development and the foundational importance of these ancestral lines of organisms make the Lower Cambrian a period of tremendous paleontologi-cal interest. To many evolutionary biologists, this is the single most interesting period in the history of life. For that reason the fossil record of this period is precious to investigators. 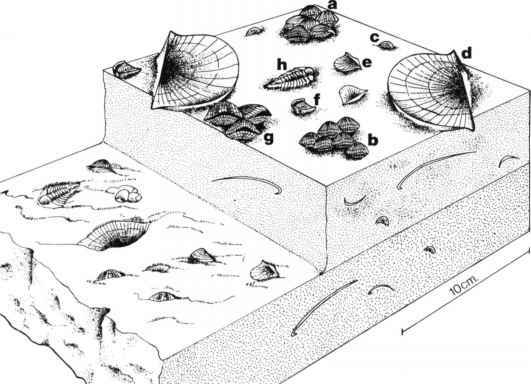 As far as the fossil record is concerned, one of the most important features of the Cambrian explosion was that suddenly numerous types of animals appeared whose bodies featured something in the way of hard parts. Up until this point nearly all life had gotten by without becoming any tougher than soft tissue. Stromatolites had formed layered colonies of blue-green algae in reef-like structures and pillow-like lumps in shallow seas since before the end of the Archean Eon, around 2.5 billion years ago. Their fossils, well-known in very ancient rocks, were primitive basic growths that did not possess the biomineralized skeletal elements in individual organisms. In the great expansion of animal types in the Cambrian explosion, organisms commonly formed teeth and gained shells and external skeletons around themselves for protection from the predators that were evolving to ever larger size in the prehistoric seas. The arms race between the hunters and the hunted had begun. These hard parts—biomineralized skeletons—constitute nearly all of the fossil record, and from such shells and teeth and jaw parts we have discovered many of the creatures that roamed the Cambrian seas. But we realize all too well the limits of the fossil record for this crucial period of evolution. Many of the Cambrian genera we know only by cryptic bits of unassembled hard parts. It is like having the turbine blades from the main combustion engine of the space shuttle and nothing else, and then asking a Victorian ship builder to reconstruct the whole vehicle from which it came. "Conodonts," for example, was the name given for years to tiny tooth-like fossils that did not seem to belong to any known creature, extinct or extant. The missing "conodont animal" was presumed to be all soft tissue, except for its teethlike elements, and paleontologists hunted in vain for traces of the rest of the mysterious animal. I recall meeting Professor Stewart McKerrow at a Paleontological Association meeting in Cardiff many years ago and talking to him about the conodont animal he had drawn in his wonderful Ecology of Fossils book in 1978. He was very proud of his educated guess of what the animal had looked like. In 1983 imprints of eel-like creatures found in Scotland, coupled with conodont fossils in place, proved an educated guess can occasionally be correct. The teeth were indeed serving as dental apparatus of some kind, just as their toothy appearance had suggested. These fossil imprints suggest that some groups of conodont animals were likely members of our own phylum Chordata, animals with backbones (or a notochord precursor of the same). Debate continues about the exact evolutionary relationships of various types of conodont animal, but until the soft tissue fossils were discovered, such questions could not be raised at all. The conodont animals are a classic illustration of the limitations of the fossil record, and the tantalizing amount of information that is ordinarily absent in the rocks. Charles Darwin insightfully viewed the fossil record as a great library; as you delve deeper in the library, increasingly fewer returns are made, until only occasional sentences and the odd isolated word are left to reconstruct what were once full volumes.